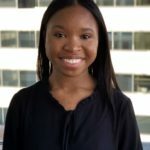 As the journalism intern for the Reporters Committee, Pariss works with the communications team to write blog posts and update online content. A recent graduate of Temple University, Pariss received her B.A. in Journalism in December of 2018. While at Temple, she served as a writer and editor for templeupdate.com, the school’s multimedia news website. Pariss has previously interned with the Urban Institute, Philadelphia Magazine, and Loudoun Now News. She has also worked as a freelance journalist and contributor for various media outlets, including Teen Vogue and Technically Media.